Time to get know how we make it! Brigadeiro is a soft chocolate sweet made with condensed milk and cocoa. It is present in every Brazilian birthday party. 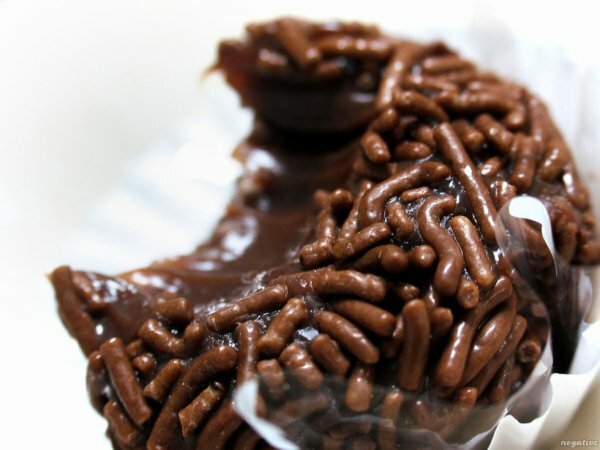 Every Brazilian knows brigadeiro, and everyone who tries it likes it. It is easy to make brigadeiros, but it can be tricky to get the perfect consistency. -you know it is ready when a) you divide it in half with the spoon and it stays parted for a few secondst and b) you scoop some brigadeiro with the wooden spoon, turn the spoon upside down, and it holds there for an instant before falling back into the pan; the video will show this! -they are ready ? Bom apetite! I want a try this!!! It looks so good!! I agree with Dr Campbell you should bring some to class!!! I feel you need to bring these to class! I think it is absolutely wonderful that you are sharing something so dear to your heart with us. It honestly looks like you are having so much fun and just enjoy your time sharing this with us. Having this true passion for something like this and sharing that through your cooking is what puts me in awe. Keep it up! That man's apron absolutely slays me. Ohhhh my gosh, I love chocolate so much so I am definitely going to try to make this with my friends and family. I like the fact that you included the step-by-step process, and you added a video for visual representation. Great post!